Some Senators are planning to resist the National Assembly’s plot to override President Muhammadu Buhari’s veto on amendments to the Electoral Act, The Nation has learnt. Their major concern is to ensure that the President’s veto survives, especially the rejection of the new Order of Elections for 2019. No fewer than 46 of the 108 senators have signed a register to stop moves by the Senate to pass the amendments to the Electoral Act without Buhari’s assent. Besides, some supporters of the President are lobbying members of the House of Representatives to oppose the plot to override his veto. The lobbyists are targeting about 260 members to sustain the veto. Twenty All Progressives Congress (APC) governors have joined the battle to prevail on Senators and Representatives to retain the present Order of Elections. Each of the governors is lobbying members of the National Assembly in his state to have a rethink on the controversial amendments. The President, last week, rejected three amendments to the Electoral Act. Of the three issues, the most contentious one is the new Section 25(1), which states that elections shall be held in the following order: (a) National Assembly; (b) State Houses of Assembly and Governorship and (c) Presidential election. In spite of alleged misgivings by the House of Representatives, the Chairman of the National Assembly, Dr. Bukola Saraki (who is also the President of the Senate), said he was on the same page with Speaker Yakubu Dogara and other leaders of the legislative arm on an “appropriate” response to the President’s veto. To many an observer, this is tantanmount to drawing the battle line. Although there have been behind-the-scene manoeuvres to end the row between the Executive and the Legislature on the Electoral Act, the two arms are said to be plotting to outwit each other. But while the leaders of the National Assembly are on the same page, there appears to be cracks among senators and members of the House of Representatives. 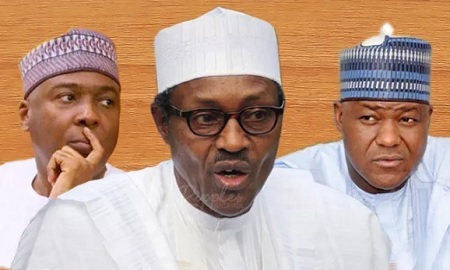 The case of the Senate was more pronounced yesterday, following the emergence of some pro-Buhari senators, who have launched a move to avert the overriding of the President’s veto. It was gathered that the senators formed a Parliamentary Support Group (PSG) to “push through their minority strength” in the Senate. In the group are 46 senators, who have subscribed to the new group and signed to reject plans to override the President’s veto on amendments to the Electoral Act. The group, which has held a series of meetings in the past two weeks, may hold another session in Abuja today (Tuesday). A ranking Senator said: “We have come together to protect the larger interest of Nigerians. We do not want any amendments that can derail preparations for the 2019 general election. “In exercising his constitutional power to veto a bill, the President has raised three issues on the amendments to the Electoral Act, including the Order of Elections. “In fact, the House of Representatives admitted that two of the issues were fundamental, leaving only the Order of Elections. “Our position is that we will not support plans by the National Assembly to override the President’s Veto on amendments to the Electoral Act. “So far, from the signatures collected, we are 46 senators backing the veto. We may be in the minority out of 109 senators but our figure is significant because to override a veto by the President, the Senate needs the consent of 73 senators. Another member of the group said: “Actually to stop the Senate from overriding the presidential veto, we just require a blockade from 37 senators. We are prepared to use our minority influence on the amendments to the Electoral Act. A first term senator from the North, who pleaded not to be named, said: “When we get to the stage of overriding the President’s veto, we will call for a division in the Senate in line with the rules. We are prepared to stand to be counted. A senator from the Northwest said: “We are not stopping at 46 signatures; we are reaching out to some of our colleagues in the Peoples Democratic Party (PDP) to reject any demand for the overriding of the President’s veto on amendments to the Electoral Act. “So far, we have secured commitment from 10 senators from the opposition. We will not expose them yet but when we get to the bridge, we will cross it. Some .supporters of the President have invaded the House of Representatives to secure the required 180 votes to stop the chamber from overriding the President’s veto. A source said: “Ahead of a full blown crisis, the supporters have started reaching out to members of the House of Representatives to disallow the National Assembly from overriding the veto. “The target is to get support from about 260 members. These lobbyists are working hard on how to make this realistic. “The lobbying is part of a Plan B put in place, in case there is a total breakdown of dialogue between the Executive and the Legislature. No fewer than 20 APC governors are backing the senators and lobbyists who have reached out to members of the House. The governors are said to be coordinated by those from Jigawa, Kaduna, Adamawa, Plateau and one of their colleagues from the South. “I think the role of the governors is to mediate between the Executive and the Legislature on amicable resolution of issues on the amendments to the Electoral Act. Where the two arms remain adamant, they will be forced to test their might based on the provision of Section 58 of the 1999 Constitution. Section 58 says: (1) “The power of the National Assembly to make laws shall be exercised by bills passed by both the Senate and the House of Representatives and, except as otherwise provided by subsection(5) of this section, assented to by the President. (2) “A bill may originate in either the Senate or the House of Representatives and shall not become law unless it has been passed and, except as otherwise provided by this section and section 59 of this Constitution, assented to in accordance with the provisions of this section. Houses on any amendment made on it. (4) “Where a bill is presented to the President for assent, he shall within 30 days thereof signify that he assents or that he withholds assent. Last week, the President rejected three amendments to the Electoral Act. In a letter to the Senate President and the Speaker of the House of Representatives, Rt. Hon Yakubu Dogara, Buhari said: “Pursuant to Section 58(4) of the Constitution of the Federal Republic of Nigeria 1999 (as amended), I hereby convey to the Senate my decision, on 3rd March 2018, to decline Presidential Assent to the Electoral Amendment Bill 2018 recently passed by the National Assembly.